On 3 June 2007, in St. Peter’s Square, with sheets of rain battering even the sturdiest of umbrellas, Pope Benedict XVI elevated a humble priest, a Passionist named Charles Houben, to the status of saint. Had St Charles been there for his own canonisation, he might have scratched his head in disbelief. Although very devout, Fr Charles was not a good preacher. He was born in Holland and served most of his life in Dublin at the Monastery of Mount Argus. He never managed to master the new language, a limitation most of us can easily imagine. And yet, a friend of Charles remembered, “When you spoke to him, you had the impression that you were talking to someone who was an intimate friend of God.” Here, stated simply, lay the essence of Charles’ saintliness. His connection to God spoke volumes to those who had a need to hear. A dedicated and loving Passionist, Fr Charles found other ways to communicate the life-giving Passion of Jesus. His presence in the confessional was one of enormous compassion, and he was especially devoted to the sick and the suffering, the lonely, the poor and broken-hearted. Word of Charles’ gifts as a healer began to spread, and on some days hundreds of people would travel to the Monastery to receive his blessing in the hope of being healed physically or spiritually. When St Charles passed away in January 1893, his body lay in state for five days. Thousands of Dubliners, more than had paid respects even to powerful statesmen, endured heavy snow for a final glimpse of a priest they had come to love so dearly. His final resting place is now St Paul’s Church at Mount Argus, the place where St Charles had prayed and served so humbly, so piously, so simply, and so deeply in relationship to God. Adolph Dormans grew up in Munstergeleen, Holland, the same town in which St Charles, formerly John Andrew Houben, was born. When Adolph was a boy, Fr Charles had already passed away, but the residents of Munstergeleen paid visits often to a small chapel dedicated to Fr Charles whose healing gifts were already well known. 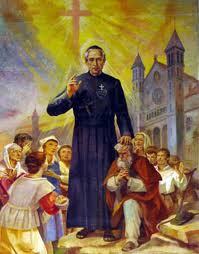 Adolph remembers praying devotedly to Fr Charles for the cure of a sick classmate. Years passed, and in 1999 at the age of 72, Adolph fell grievously ill quite suddenly and was found barely conscious. He was taken to the emergency room, and after the doctors’ evaluation and immediate surgery, Adolph’s wife was told there was absolutely no hope. His appendix had ruptured two days prior and the toxicity was so profound that it had already deteriorated other internal organs. They left the wound open for treatment but told Mrs Dormans to gather the family. It was then that Adolph asked his wife to receive permission from the pastor to bring the relic of Fr Charles to the hospital. Together they prayed that Fr Charles might bless the hands of the doctors, and that through his intercession Adolph might be healed. He laughs when he remembers praying that if a cure wasn’t possible, could Fr Charles make sure he had a good place in heaven? Twenty-four hours after slipping into what the doctors identified as a pre-death coma, Adolph reawakened to their utter amazement. A week later he had been totally cured. There was no sign of infection of any kind. The doctors kept the wound open for treatment for another seven months; he convalesced without pain, again to the doctors’ bewilderment. When the medical team finally decided to close the wound and see if his organs could function at all on their own, Adolph’s body adjusted without problem. The doctors were dumbfounded. During the Vatican’s investigation of the cause for canonization of Fr Charles, multiple doctors confirmed that there was no medical explanation for how this healing had occurred. On June 3, the day of St Charles’ canonization, Mr Dormans was beaming with gratitude. “I will always thank St Charles that he chose to reveal his sanctity through me. I pray that he will continue to bless the people who come to him to be cured,” he said with humility and a joy beyond words.